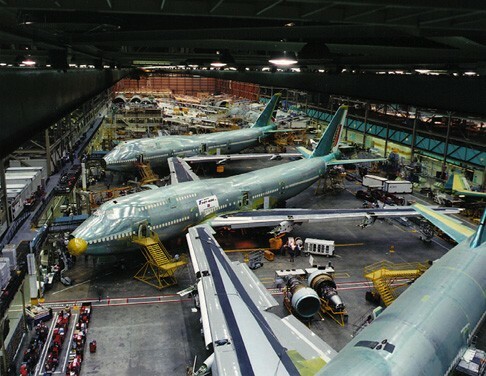 The Boeing 747, 767 and 777 airplanes are manufactured in Everett, Wash., which is located 30 miles (48 kilometers) north of Seattle, near Snohomish County's Paine Field. Paine Field is a regional airport with a 9,000-foot (2,743 meters) runway. The site's main assembly building, which the Guinness Book of World Records acknowledges as the largest building in the world by volume, has grown over the years to enclose 472 million cubic feet of space (13.3 million cubic meters). Its footprint covers 98.3 acres (39.8 hectares). The original factory was completed in 1969.